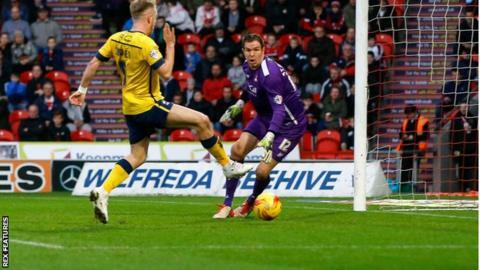 Scunthorpe stretched their unbeaten away run to four games with a hard-earned win at Doncaster. Paddy Madden gave the Iron the lead in the first half as he tapped in Luke Williams' cross from the left. Cedric Evina and Nathan Tyson both hit the side-netting for Doncaster before the break and Evina shot just wide after the interval for the hosts. Cameron Stewart, on loan from Ipswich, came closest to levelling the scores when he hit the crossbar in added time. "It's a magnificent way to start the Christmas games, so I'm absolutely delighted. "It was a great performance, great goal scored and a really good solid away performance. "The best present you can get is three points." Match ends, Doncaster Rovers 0, Scunthorpe United 1. Niall Canavan (Scunthorpe United) is shown the yellow card for a bad foul. Second Half ends, Doncaster Rovers 0, Scunthorpe United 1. Attempt blocked. Andy Williams (Doncaster Rovers) right footed shot from the centre of the box is blocked. Corner, Scunthorpe United. Conceded by Cedric Evina. Corner, Doncaster Rovers. Conceded by Scott Wiseman. Attempt missed. Cedric Evina (Doncaster Rovers) header from the centre of the box is close, but misses to the left. Foul by Tommy Rowe (Scunthorpe United). Attempt missed. Dany N'Guessan (Doncaster Rovers) right footed shot from the right side of the box is close, but misses to the left. Substitution, Doncaster Rovers. Dany N'Guessan replaces Nathan Tyson. Corner, Doncaster Rovers. Conceded by Luke Daniels. Attempt saved. James Coppinger (Doncaster Rovers) right footed shot from outside the box is saved in the centre of the goal. Attempt missed. Cedric Evina (Doncaster Rovers) right footed shot from the left side of the box is close, but misses to the right. Substitution, Scunthorpe United. Charlie Goode replaces David Mirfin because of an injury. Delay in match Luke Williams (Scunthorpe United) because of an injury. Delay in match David Mirfin (Scunthorpe United) because of an injury. Attempt missed. Andy Williams (Doncaster Rovers) right footed shot from outside the box is just a bit too high. Substitution, Scunthorpe United. Jamie Ness replaces Stephen Dawson. Conor Grant (Doncaster Rovers) wins a free kick in the attacking half.